There are many factors that can make a region attractive to businesses looking to set up shop. Some of those factors include geography, taxes, regulatory requirements, quality of workforce, and transit options. North Texas checks off many of these boxes, making it the place when it comes to business growth and relocation. According to MarketWatch, the North Texas area has been ranked as the most business-friendly city in the country. Today, we are digging a little deeper to uncover DART’s role in attracting new businesses, as well as supporting existing ones now and for the future. According to a Smart Growth America study, a greater number of businesses are re-locating back to cities and moving from the suburbs to high-density mixed-use areas. In the same vein, businesses looking to retain and recruit a from a diverse talent pool consider access to public transit a must when choosing a location. This transition is due to a myriad of reasons, including increased access to a wider range of transit options. That’s where DART comes in. Along with our business-friendly tax structure and regulatory environment, North Texas is home to a multi-modal transit system complete with buses, light rail, paratransit, commuter rail and streetcars. Each of these work together to give our region mobility options. Transit options are exactly what businesses are looking for when pursuing relocations. Take Amazon for example. In Amazon’s request-for-proposals to cities for their second headquarters, they cited direct access to rail, train, subway and bus routes as a priority. You can look to the recent corporate relocations right here in North Texas, like Toyota, Liberty Mutual and State Farm. DART hopped into action to accommodate these new work hubs by expanding and altering current bus routes. Along with new routes and streamlined service, DART introduced a nonstop bus line to ensure that there were faster connections to major corporate campuses in Plano. The examples above illustrate that businesses consider public transit and mobility options when it comes to big decisions about relocation. North Texas must continue to expand and improve our multi-modal transit system if we want to continue to attract new businesses and sustain our impressive growth. Right now, 1 million jobs are within walking distance to DART bus or rail, and 400,000 jobs are within walking distance of DART rail. However, DART is always refining our transit system to make mobility more efficient for everyone, even those who don’t ride. Whether it’s offering employees with a diverse talent pool, efficiently moving goods around the region, or easing the flow of traffic, businesses can survive and thrive, partly thanks to DART. 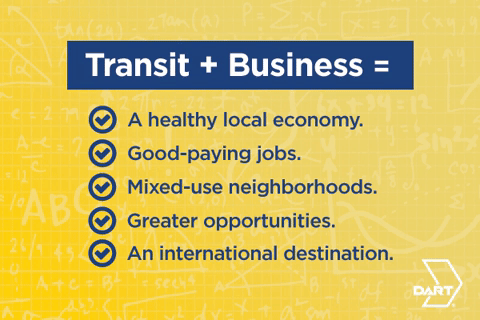 Attracting and supporting businesses is top of mind at DART because business + transit = a prosperous region for all.